The annual NCRCL Open Day was held on Saturday 11th June 2016 at Digby Stuart College, University of Roehampton. 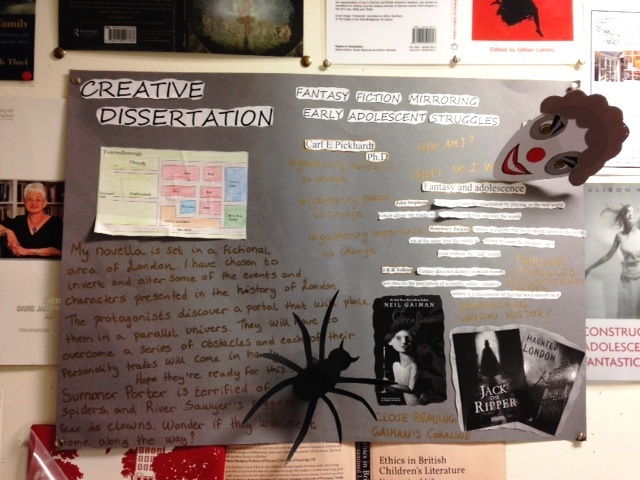 Gail Pilkington, a Distance Learning MA student, attended the event and has written her impressions of the day. Visiting the university as a distance learner can be a little daunting, especially with all the building work on campus, but from the security staff to fellow students everyone I met was exceedingly helpful and friendly. With excellent cake, biscuits, and coffee, the Open Day started with informal chats and the air of hospitality continued. Having only met my tutors through Skype, it was lovely to actually see them and to hear the brief introductions from all the NCRCL staff. Aidan Chambers then began his talk ‘The Stranger Within Me’ and the audience was captivated. We were challenged: Who is your second self? Who is the stranger within, the writer who writes? While the talk took some unexpected turns, the time passed unbelievably quickly with everyone being challenged to “find your voice”. Inspired, we took our first break to chat with other attendees and lecturers, as well as to see the posters* produced by final year students on their dissertations, both critical and creative. We returned for the second part of Aidan Chambers’ talk with bated breath: Chambers’ story of finding the stranger within him, the true voice for each of his novels. We were encouraged to see the novel as an artwork, but to understand that in undertaking a novel we needed ‘the energy of delusion’, the confidence to write and to fail. 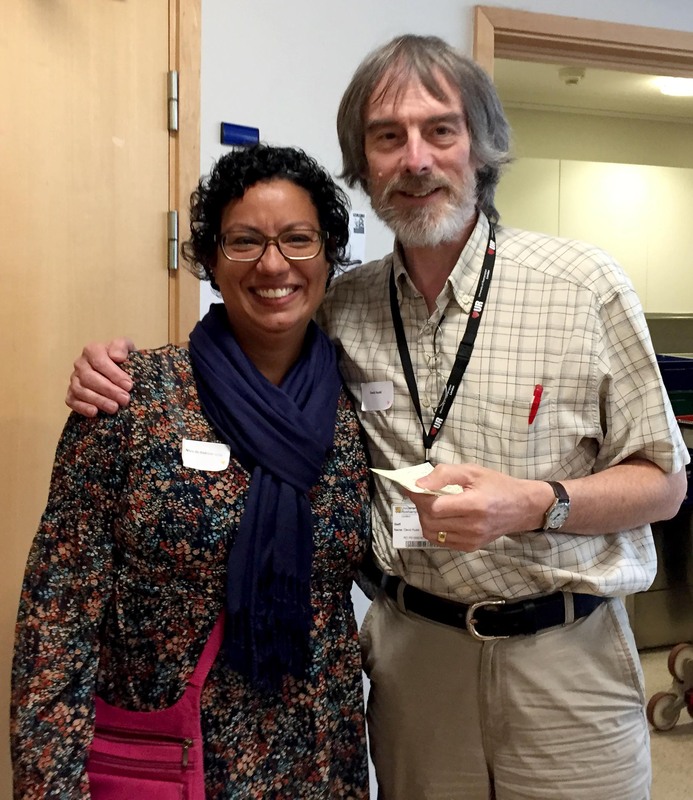 Nivia De Andrade Lima, winner of the Penni Cotton Prize for work in Visual Texts, with Professor David Rudd. We could have continued to listen to Aiden Chambers all day, but unfortunately our time was nearing its end. The morning concluded with hearing about the excellent work of two current MA students: Nivia De Andrade Lima, Distance Learning MA student, was awarded the Penni Cotton Prize for her Visual Texts essay ‘The Ironic Use of the Gutter in Postmodern Picturebooks’; Emily England received the Pinsent Prize for her strong performance on the on-site programme; and Annette Russell was awarded the Hancock Prize for her strong performance on the Distance Learning programme and her dissertation, ‘”Who’s that girl?” Fracturing postmodern female selfhood in adolescent fiction’. The Open Day finished with a tour of the university library by Julie Mills, Subject Librarian in Children’s Literature, which in itself was a great reason to visit the campus. The tour was enhanced with tips from other students on good books to read for next year’s modules….so much for a summer beach read! *Poster presentations by current MA students studying on-site or by distance learning. A winner was selected from each group. 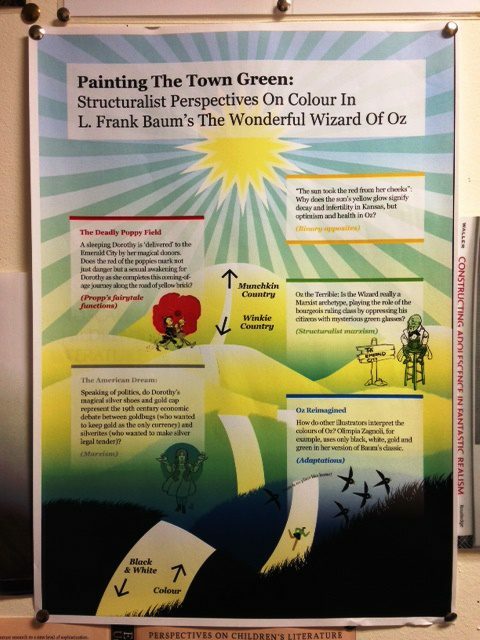 Winning poster by Siobhan O’Brien, Distance Learning MA student. Winning poster by Stine Storli Andreassen, on-site MA student. For bookings, visit the Roehampton eStore. We hope to see you there on 1st July! Bookings Open for Archiving Childhood! The 3rd NCRCL conference celebrates the archive in all its forms and recognizes it as an important aspect of childhood culture. “Archiving Childhood” emerges from a collaborative project reflecting the ongoing research of members of the National Centre for Research in Children’s Literature. Our keynote speaker is Dr Keira Vaclavik, Senior Lecturer at Queen Mary, University of London and Co-Director of the Centre for Study of Childhood Culture, who will be presenting on Lewis Carroll’s Alice as style icon and her collaboration with the V&A Museum. The programme showcases innovative research inspired by archives, collections, museums, and libraries around the world. We will end the conference with a wine reception and a performance by acclaimed singer-songwriter Darren Hayman who will also be talking about collecting folk lullabies, musical research projects (including his response to William Morris, one of Whiteland’s most famous associates), and the influence of childhood memories on his work,. There will be exciting exhibitions and an interactive archive trail to explore during the day. For updates and glimpses into the archives visit the Archive Childhood blog or follow us on Twitter @archivechild!